Warns you about conditions on or near the road. Helps direct you to cities and towns ahead. Tells you about traffic laws and regulations. Tells you about road construction ahead. 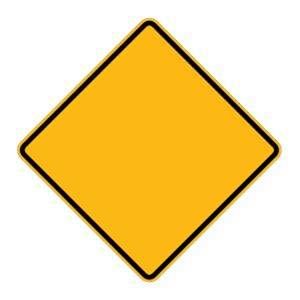 Warning signs, which tell you about conditions on or near the road ahead, are usually diamond-shaped with black symbols or words on a yellow background. What does alcohol do to your driving skills and judgement? Alcohol negatively affects many skills needed for safe driving, including your reaction time and ability to see clearly. It can also harm your judgment of speed and distance, lower your inhibitions, and make you more prone to taking chances.